Valentine’s day. It’s fast approaching and whatever you think of it, and whatever that significant other (or object of unrequited desire) might say or do – or be overheard muttering – it’s not an opportunity any budding Romeo or Juliet should forget. And talking about unrequited objects of desire, Forman and Field – purveyors of devilishly tempting packets of smoked fish and other goodies I could never quite afford – got me thinking about that very occaision. Specifically what to eat. They did this by issuing a challenge, laying down the gauntlet to a host (six) of food bloggers. Or rather, laying down the gauntlet on our behalf because this was a competition to see who could come up with the best Valentine’s dish or menu from a box of mystery F&F ingredients. How exciting! And flushed with the joy of competitive brawning I picked up that heart shaped gauntlet. 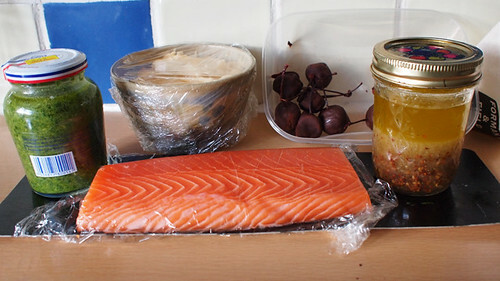 And so, a week later a mystery box was delivered to Meemalee’s Kitchen, Paul from How Not To Do A Food Blog, Bribed with Food, Food Urchin, Jo’s Kitchen, Essex Eating and I. 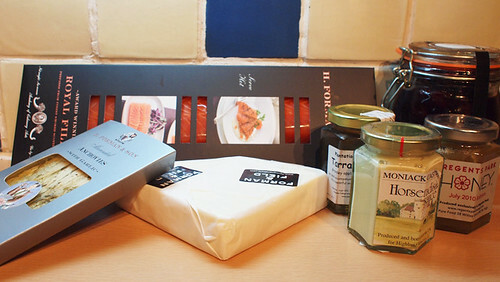 It was (given aforementioned attitude F&F goodies) with some excitement that I tore into the box to find: A royal fillet of London cure smoked salmon, marinated anchovies, Kirkham’s Lancashire cheese, horseradish sauce, apple & tarragon jelly, Regent’s park honey and a huge pot of brandied cherries. Making something using all the ingredients was going to difficult. This was a Valentine’s meal so I didn’t want to create anything that took too long to put together. This is the day you want to spend with your significant other/object of desire right? Not slaving over a stove and sweating like a pig. And so my menu is one that requires minimum effort on the day – but is still romantic, aphrodisical and not too heavy. Because you might get lucky. And you don’t want too heavy a belly when that happens. Right? There are plenty of contrasting and complementary tastes and textures. Peppery and crunchy, pungent and piquant, smooth and slippery – oh yes! Lip smacking food that involves some slurping and sucking. Rude food. 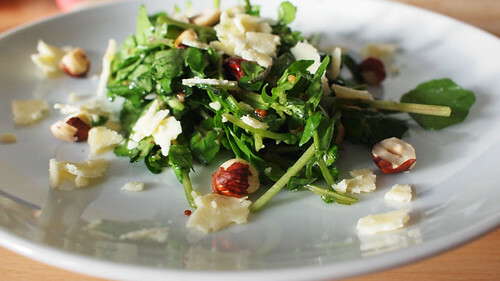 To start, a simple watercress salad tarted up with roasted hazelnuts and crumbly creamy Lancashire cheese, all pulled together with a sweet and tart dressing made with the tarragon and apple jelly. Next up the salmon. The royal fillet is a beautiful cut of meat, all silky smooth with a subtle and gently smokey edge. If the Scottish did sashimi, this is how they’d do it. It was too good to mess around with. It just needs something to play off that oily fatty goodness. Which is where anchovies come in. Whizzed into a salsa verde with some fresh herbs, capers and mustard, they provide a piquant counterbalance to the smooth fish. Something to make the tastebuds sing. Accompanied by al dente, almost raw, courgette ribbons spritzed up with lemon and black pepper. Simple, tasty and fresh. And a new potato salad with a light horseradish mayonnaise to provide a little creamy, gentle-with-a-hint-of-heat, ballast. In an last minute burst of inspiration (once again from Mrs GW) I mixed some of the tarragon apple jelly with bison grass vodka and put it in the freezer before I started assembling. A sub-zero palate cleanser. Dessert was the honey ice cream. The Regent’s Park honey we got was wonderfully fragrant – redolent of warm spring days – and gave the ice cream a surprisingly subtle edge. Sweet and honeyed with just the hint of cinnamon. 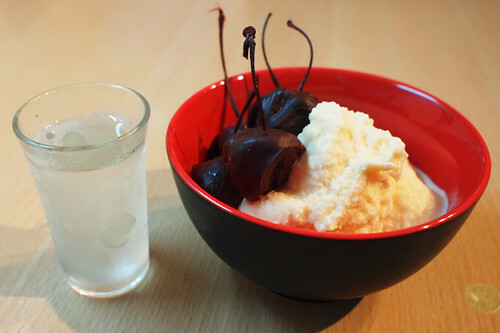 The cherries providing an alcoholic and fruity contrast. The whole lot only took about forty minutes of preparation on the day and while filling, it was not overwhelming. So if the meal served its tempting purpose and the dishes were left on the table as you ran up to the bedroom, then it wasn’t one that would sit heavy in the stomach. So now tell me, because I’m curious, what is your idea of a great valentine’s meal? Leave your answers in the comments below and you’ll be in with a chance to win a hamper of tempting Forman & Field goodies. I know there seems a lot, but here’s a bunch of stuff you can do beforehand and the rest really doesn’t take long – with a little organisation. Assuming you’ve already made the sauces (see below) then it’s all just a matter of assembling. So put the icecream in the fridge, shake some bison grass vodka and tarragon apple jelly together in a jar and put it in the freezer, and get going. Roughly chop the hazelnuts, and toss half of them with the watercress, half the cheese and the dressing. Put the salad on the plates and scatter over the rest of the cheese and hazelnuts. Smoked royal fillet of salmon with a warm horseradish and new potato salad and courgette ribbons. Put two pans of water on to boil before you start to make the salad above. Add the new potatoes to one and bring to the boil and leave to bubble away for 15 minutes. Drain and leave to cool a little. 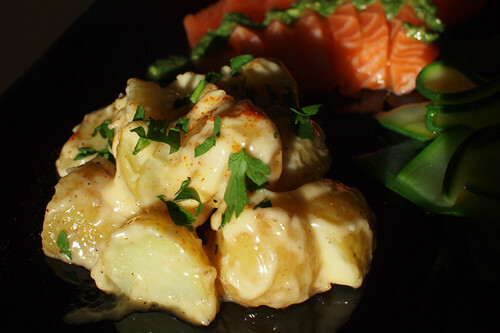 Chop each potato into four pieces and toss them with the mayonnaise. Pile carefully onto the plate and sprinkle a pinch of cayenne and some chopped parsley over the top. 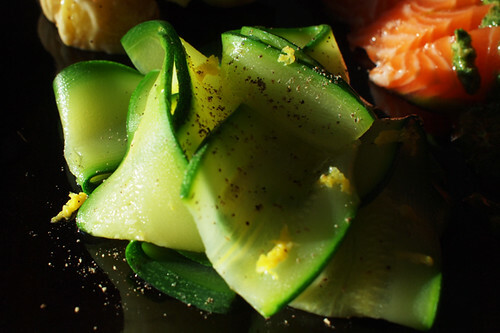 Slice the courgettes into fine ribbons using a mandoline, peeler or sharp knife. When the second pan comes to the boil, add the courgettes and cook for two minutes only. Drain and refresh under cold water. Curl the courgettes onto the plate next to the potatoes and scatter over the lemon zest and some of the juice along with a little olive oil and black pepper. 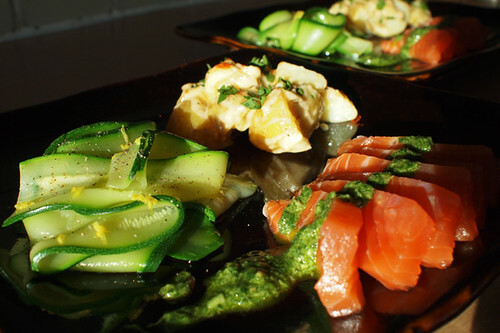 Slice the salmon into thick slices – approx 7-8mm (sashimi thickness for Japanese food lovers). Lay then on the plate infront of the potatoes and courgette and spoon over a little of the salsa verde. It’s Valentine’s (or some other special) day and the last thing you want to be doing is spending the day all alone in the kitchen cooking. You’d much rather be pulling the cork on a great bottle of wine and looking deeply into someone else’s eyes, wouldn’t you? Or maybe it’s more of a case of cracking open a few cans and gettng the playstation warmed up, or possibly line dancing in plaid shirts to a fiddle reel. Whatever floats your boat, you want to spend the day doing cool stuff. Not blending sauces. So, all of these can be made a day or two beforehand and will mean the most you have to do is cook a the potatoes and courgettes and then assemble the rest. Easy peasy. Put all the ingredients in a jar and shake vigorously until combined. Strip as much of the thick stalks as possible from the parsley. Put all the ingredients in a blender and blend until a fine paste. Pour in more olive oil until the paste loosens into a thick sauce. 2 tblsp horseradish sauce (blend if it’s coarsely grated). Whisk the egg yolks and add a few drips of the oil and beat hard. Keep adding the oil a few drips at a time, beating hard all the while. The mixture should start to emulsify and thicken. Once about half the oil has been added in this way you should have a thick mixture the consistency of whipped cream. From here on in you can add the oil in a thin trickle, but keep beating. About half way through beat in the lemon juice and at the end add the horseradish and black pepper. Pour the milk and cream into a saucepan and heat until warm, then whisk in the egg yolks and sugar before stirring in the honey and adding the cinnamon stick. Keep stirring as the honey melts and the mixture gets hotter. Just before it boils take it off the heat, pour into a jug and cool down as fast as possible. Then put it into the fridge for 6-12 hours, or overnight. Make according to ice cream maker instructions. If making the day before put it into the freezer and remove about 30 mins before you plan to eat it. Just before you start eating is a good time. Break the chocolate into pieces and put into a perspex bowl. Put the bowl over a pan of boiling water and stir the chcolate until it melts. Remove from heat and leave for five minutes. Dip the cherries into the chocolate and swirl until totally covered. Leave to cool on a piece of grease proof paper. They’ll keep in the fridge for a day or two. Awesome work fella, looks amazing and used pretty much all the ingredients as well! @Paul – thanks – and yes, it is tough isn’t it? @catty – thanks! It did taste pretty good. That ice cream is good (still lots left in the freezer). @Miss Whiplash – thanks – this is one tough cookoff. @Gin and Crumpets – That is exactly the reaction I’m looking for. Looks tasty and light and quick to make, everything you want on a Valentines day. You don’t want to spend the night in the kitchen, come out sweating and exhausted. @jamieoliver_ed Love the fact that the meal only took around 45 minutes to prepare – you need time to be with the one that you love. I also like the fact that it is a lite meal – you definitley do not need to be weighed down afterwards! Well done mate! Fabulous use of your resources Grubbie. My ideal Valentines menu would definitely involve some salty oysters, creamy smoked salmon and a massive rib eye steak the size of my head. For dessert, your honey ice-cream would do down well, or a tarte tartin or clementine pudding with vanilla icecream. That said, last year, I insisted on a Byron burger. Honey ice cream sounds lovely! and the salad looks very pretty – beautifully photographed. My idea of a great Valentine’s meal is something cooked at home. That way you avoid the crowds, and you also feel justified in splurging on some great ingredients. Somehow either salmon sashimi or ribeye steak is involved as well. Hmm, I better start planning this year’s meal. My ideal menu is definitely cooked at home – would never want to go out on Valentine’s Day! Probably my chicken liver and port pate, which needs to be made a day or two in advance, then a really good rib eye steak with a delicious sauce, and, given my current obsession, probably lemon posset for pudd. And a seriously fantastic cheeseboard! I love the look of your salad and your wife’s idea for the vodka. Really good ideas out of an unusal ingredients. For me a valentines meal has to have a bit of luxury about it, but also be something tactile that I can eat with my hands. A rack of lamb would be perfect! My idea of a great valentine’s meal, must be tactile for the tastebuds and the fingertips. Heavy on the protein and light on the carbohydrates. The salad looks so pretty! I bet it was completely delicious. I’m desperate to chuck a couple of slices of pear in it. My valentine’s menu would be a mash up of things I love so probably isn’t very balanced – a salad to start with chicken livers and crumbled up crispy bacon. Probably a very slowly roasted shoulder of lamb or a roast duck with a red wine and redcurrant jelly gravy. I’m pants at making pudding, but I’d either go for a pannacotta or something heavy and disgusting like a chocolate bread and butter pudding or treacle sponge…with pudding wine! Which I LOVE. @Violet – I agree totally about the tactility (is that word?) of Valentine’s food. And banana chips with the honey ice cream – yes please! @Emma – i actually think that the less work involved in doing a romantic dinner the better. My fall back is usually a good sirloin or ribeye steak, some sauteed potatoes, a green salad and a bottle of bubbly – quick, easy and delicious. And I reckon the deli idea might be even better! Slow roasted lamb, heavy and disgusting pudding AND pudding wine, what could be better?